NEV Vogler brought seven warbirds with him to Gladstone but he reckons he has about 30 at home. He's been out flying them for the past week at the Gladstone Aero Model Club grounds in Yarwun. To attend a warbirds event, very simply you have to have a war time era plane. One of the planes Mr Vogler brought with him was a Kawasaki hien, which got the American nickname "Tony". Last week he packed the caravan and with his wife and their little dog they made their way up the coast from Bribie Island. "I've been out every day flying them," he said. "When we leave here we'll have a trip around after this... I've never been here before." He was flying the smaller planes because that's what could fit in the car. "I'm not allowed them in the caravan," he said. Mr Vogler said the planes could range from $150 to $10,000. "It's not about having the biggest or best plane, it's whether you enjoy the sport enough to be happy with what you're flying," he said. Warbirds take to the air: CHECK out the annual meet at Gladstone Model Aero Club on the weekend, where they were flying warbirds. He said he was building planes all the time. "It's a good feeling... and when you're tired of flying you go back to the shed and build again." But he said it wasn't just about the planes. "You build a fellowship flying," he said. "It's not just the aero planes, it's the friendship and the social side of it," he said. Mr Vogler said it was similar to how "Men's Sheds" act. 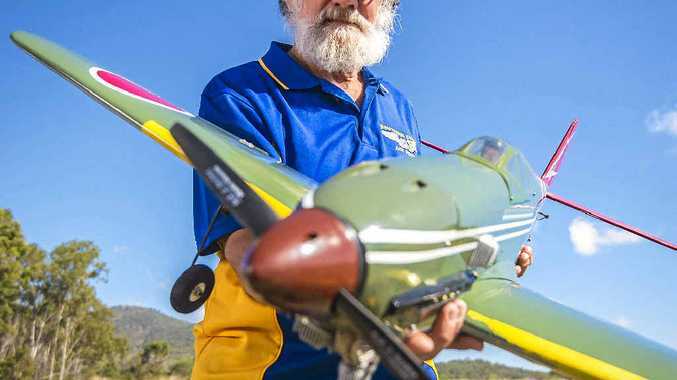 "When I need some therapy I'll call Sharpey and we'll build some planes and have a chat," he laughed, talking about the Sports Aeromodellers Association Moreton Bay Region president Bill Sharpe.